We celebrated our baby turning one last week. It was a perfect day. Steaming hot and humid but perfect nonetheless. I only get to go crazy for their first birthdays and this one was extra fun to plan and prepare. I didn't want it to end. You saw this invitation awhile back. These were donated by The Pinwheel Press. The invite set the tone for the party and I just love it. 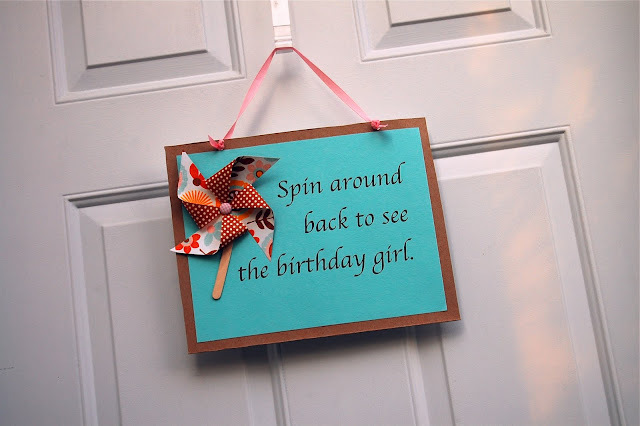 I created a sign out of cardstock to let guests know where to find the birthday girl. I chose pinwheels and polka-dots as the theme because they are two of my very favorite things. Pink, yellow, and aqua became the main color scheme. I wanted a soft vintage feel to the party and I was able to use so many things from around our home to accomplish just that. One of my favorite things was the cupcake stand borrowed from my very best friend. 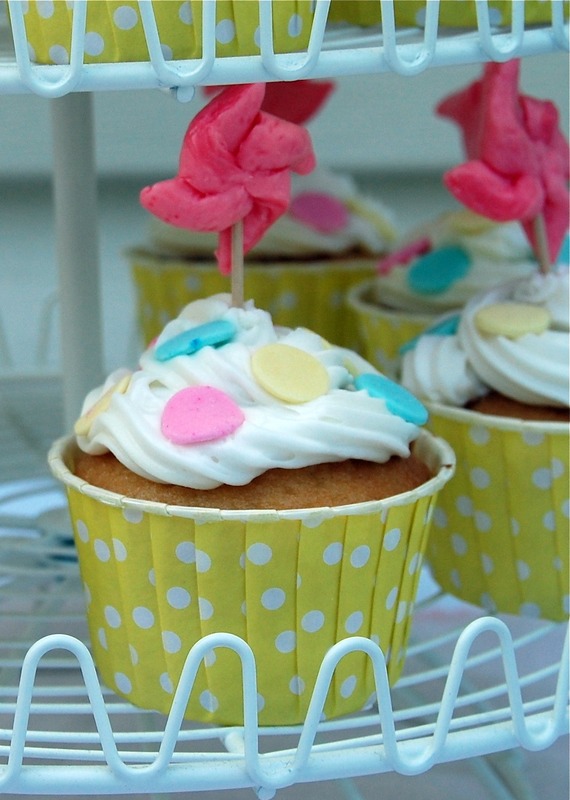 It was the perfect holder for the pinwheel and polka-dot cupcakes! 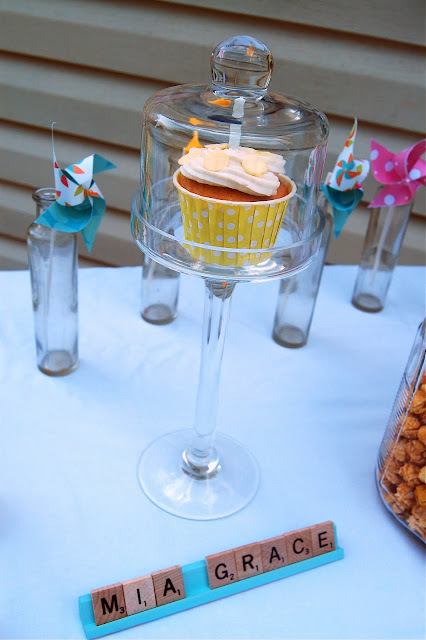 These adorable yellow and white cupcake holders were donated by PickFair, a completely amazing Etsy shop that is a must see! 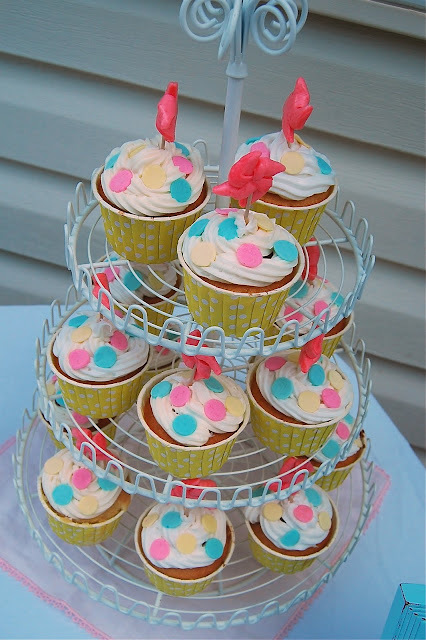 For the toppers, I was inspired by the skewers used in the decor of another pinwheel party you can find here. They turned Starburst candy into pinwheels. Genius. I fell in love with that idea and had to use it somehow. The birthday girl had her own special cupcake, of course. 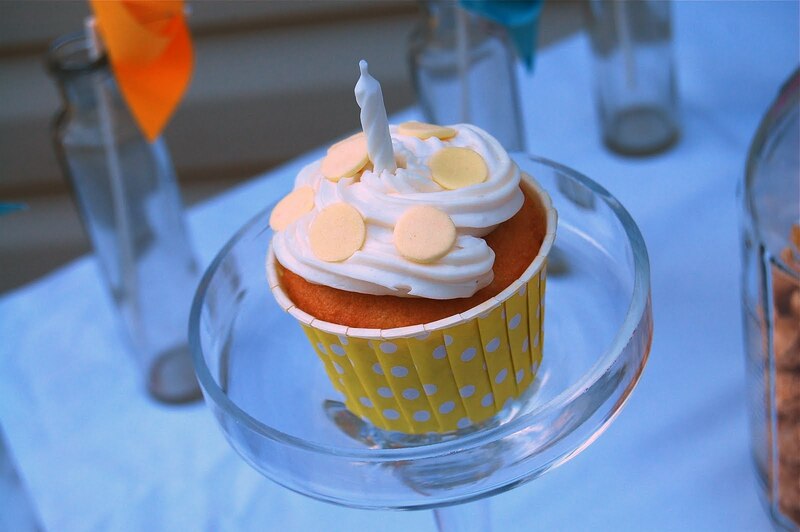 A simple yellow and white one with a candle in place of the Starburst pinwheel. Of course there had to be a bunting. I actually made a real one this time, no staples or glue involved. A two sided beauty of a banner with double wide bias tape sewn to the top. All fabric was purchased at JoAnn's. 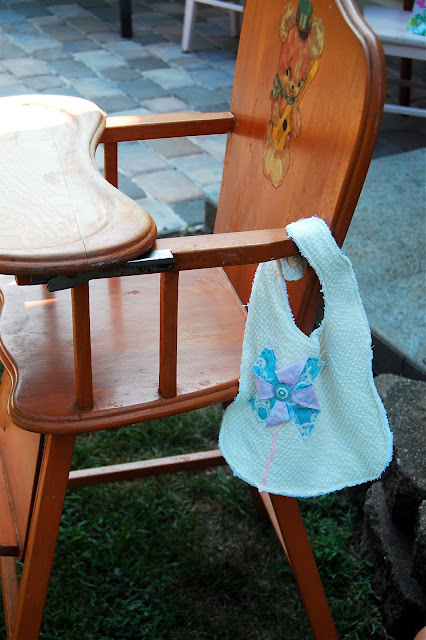 The same fabric was used by Grandma to sew the birthday girl and her big sister special party dresses. Then there was the food. Very simple but yummy. Balled watermelon was the one healthy snack available because you gotta have at least one. There were pinwheel sandwiches made with the recipe found here. I used turkey and ranch dressing mix rather than ham and italian. 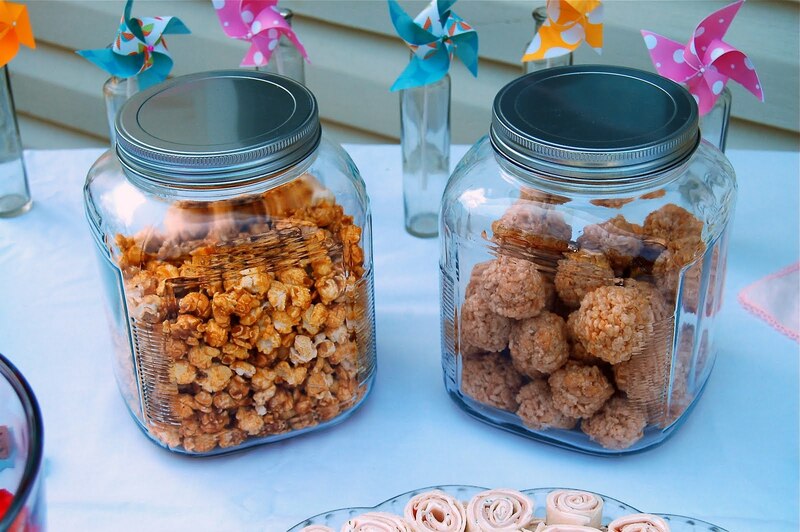 There were also Rice Krispie treat balls and caramel popcorn. The goody bags were filled with candy. 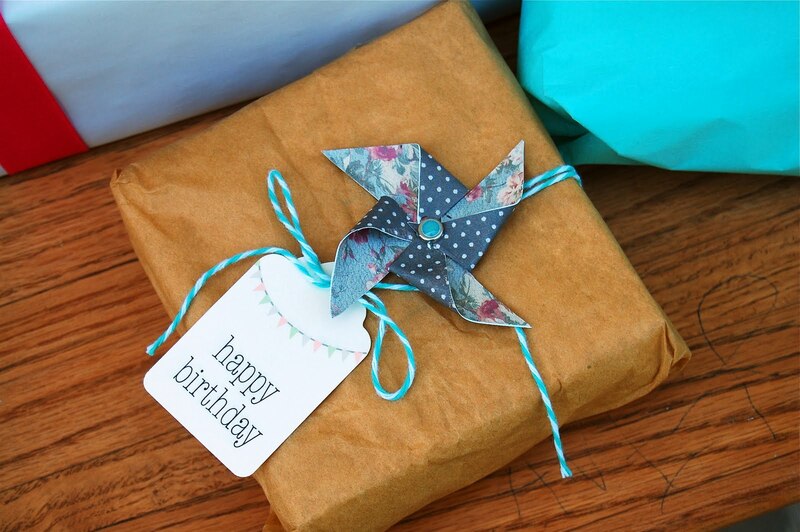 I made little paper pinwheels, glued tiny buttons to the middle, and then glued the pinwheel to a mini clothespin. I was giddy over these things. Possibly my favorite part of the party. I got the idea from here. 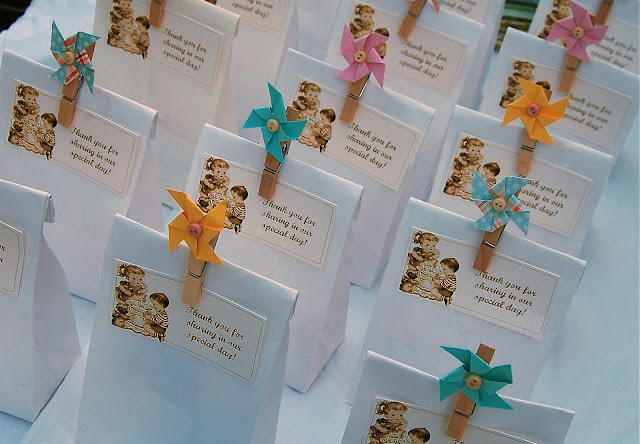 The image on the goody bag tags is a freebie from Pretty Little Studio. The custom Mia flashcard also came from Pretty Little Studio. My birthday countdown frame made its way onto the table too. 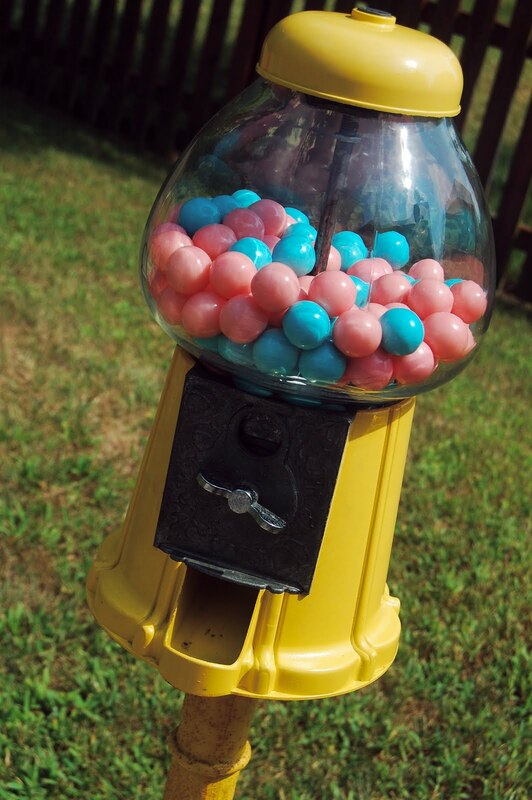 The yellow gumball machine came from a garage sale and belongs to my niece. Wish it was mine. Isn't it great? She was kind enough to let me borrow it. I found the pink and aqua gumballs at a local party store. 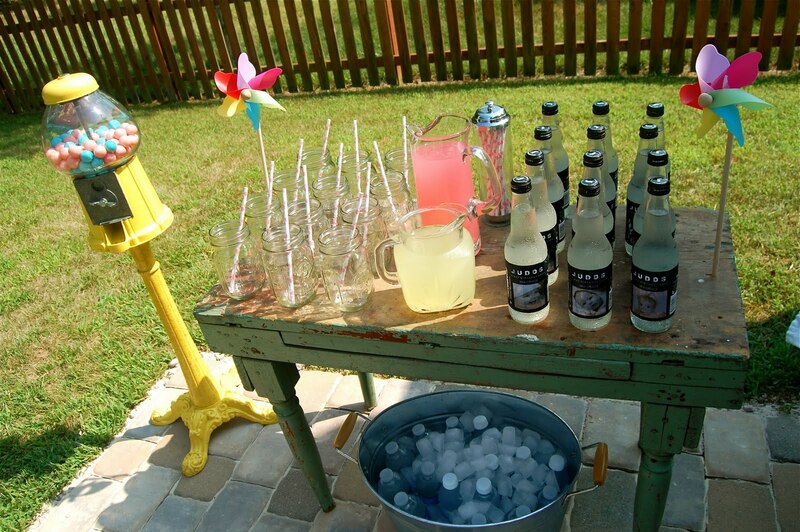 The drink table is an old one that belonged to a great aunt. My sewing machine usually lives on it. It fit the lemonade, mason jar glasses, and soda bottles just right. The pink and white polka-dot straws made sipping the lemonade even more fun. They also came from PickFair. I love paper straws so much that I am thinking about starting a collection. Would that be weird? 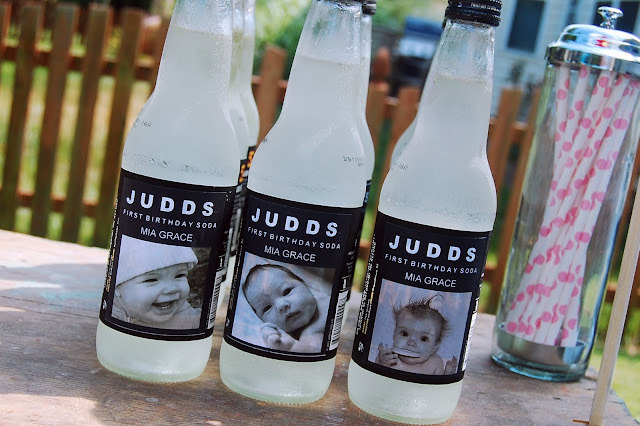 You know those super cute soda bottles that have neat pictures on the label? Well, our name happens to fit just right and some guests don't even notice that they are personalized. I did the same labels at my son's first birthday party two years ago. 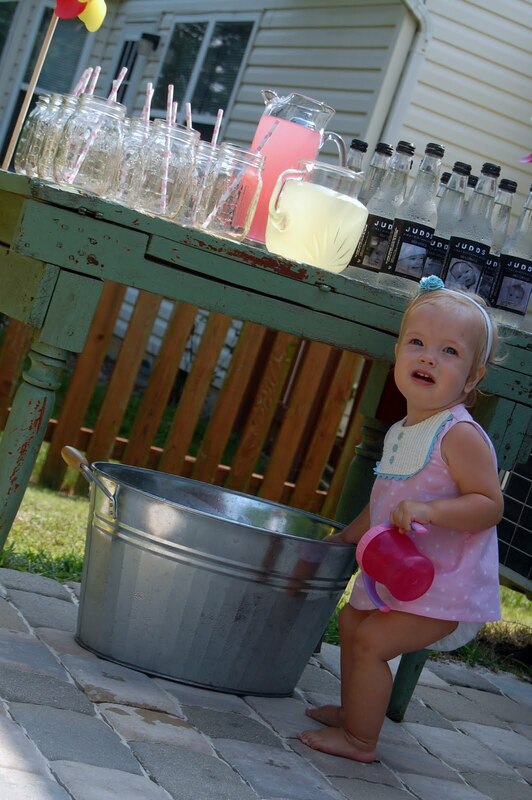 The birthday girl had the right idea staying by the bucket of ice since it was 90+ degrees outside that day. 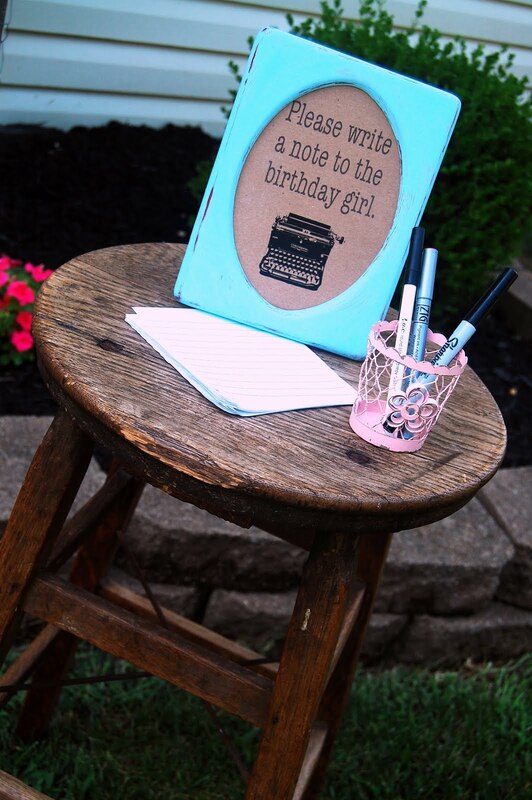 I used an old stool from our living room to hold a frame, paper, and pens asking guests to write the birthday girl a note. My husband was updating the garden with a new trellis for the beans and I got to make use of our old one at the party. It became a photo display with mini clothespins and black and whites of the birthday girl throughout her first year. 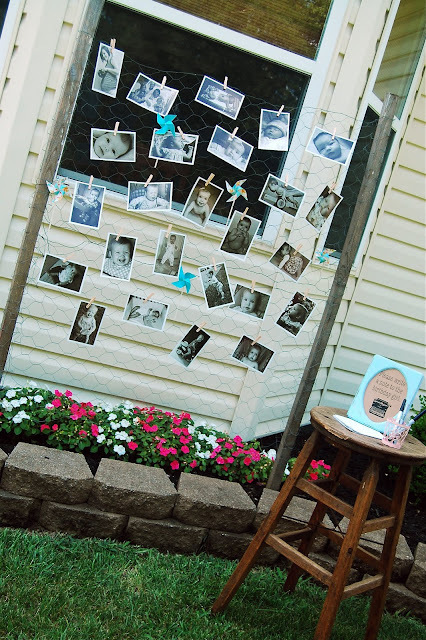 I was going to take off the chicken wire and hang the photos banner style until my Mom had a brilliant idea. Why don't you just hang them on the wire? Perfect. Thanks, Mom. 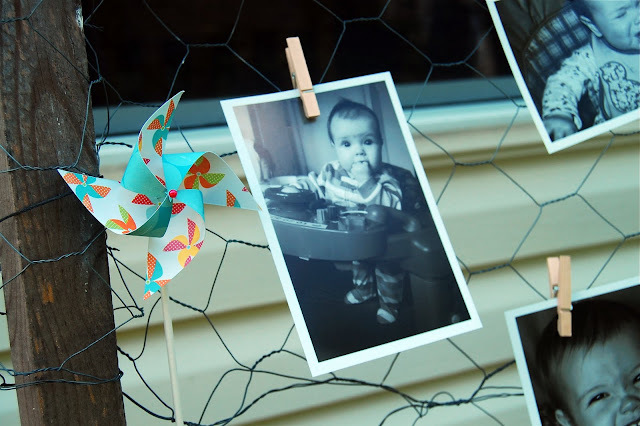 I popped in a few little pinwheels throughout the wire for a pop of color and fun. The pinwheels were donated by the Etsy shop aubabi78. She makes beautiful mini pinwheels that actually spin in all kinds of fun colors and patterns. Aren't they adorable? We used Daddy's old highchair for cupcake time. And of course the pinwheel bib I shared a couple weeks ago was ready and waiting. The birthday girl's cupcake had its own special place on the table. And it was a big hit. She loved it and was completely covered in icing in no time. I used kid sized table and chairs from our home for guests to place their gifts. 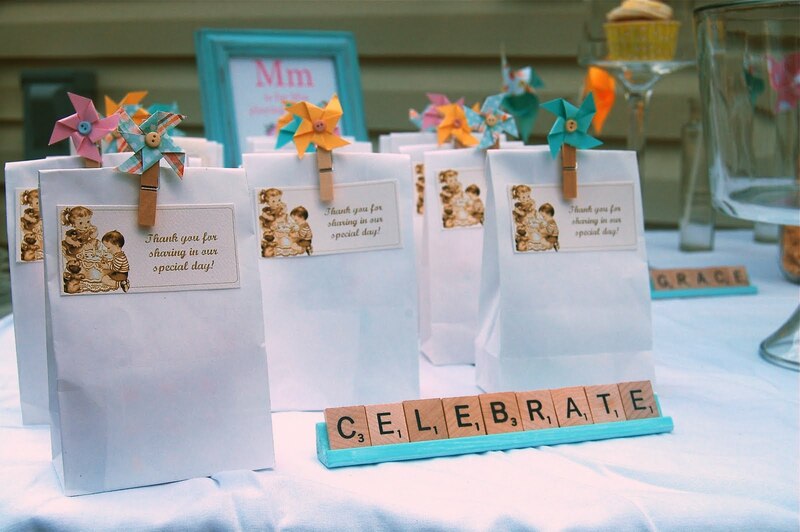 The guests even got into the theme with their adorable packaging. Love that. My parties are always done on a very small budget which makes it such a fun challenge! It really is amazing what you can with stuff you already have around your home. Thanks for checking out my party! Now you can check out these blogs where I will be partying throughout the week. Where do you buy all of your scrabble tiles? Etsy? Cute! I'm also planning a birthday party for my soon-to-be 2 year old (minniemousebirthday.blogspot.com), so I can relate with how much work it must have took for you to have such an awesome party! I'd love for you to stop by and add your fantastic party to our first blog party this Thursday! It's a party specifically for kids' and teens' craft projects and other ideas, so your idea would be perfect! Hope to see you then! Oh my goodness! What beautiful girls and beautiful party! 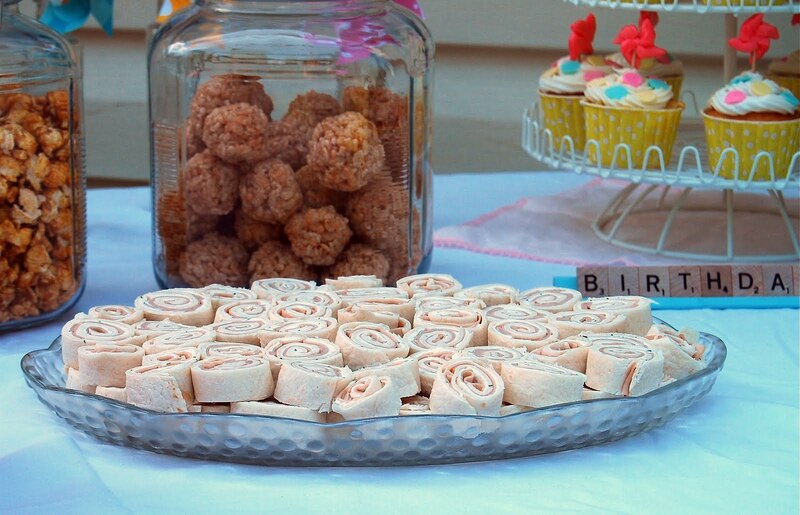 I'm in love with the chicken wire for photo's and the candy pinwheels for the cupcakes. Of course I'm partial to the baking cups and straws, wink, wink! Thanks so much for letting us be part of your special day! Lovely party! Do you hire yourself out for event planning?? Ha! Seriously, though, you thought of everything and pulled it together so nicely. What a beautiful party! 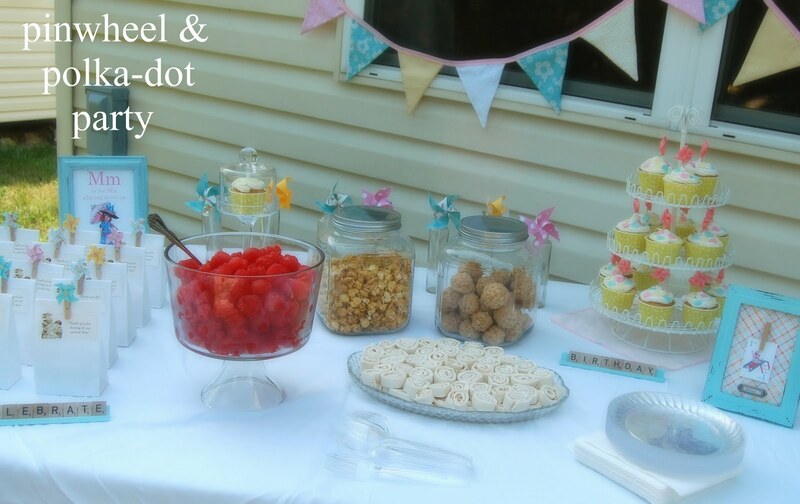 I am featuring parties on my blog every Friday and I would LOVE to feature this one. Email me at auntielolocrafts at gmail dot com and we'll talk! Tiffany this is adorable! I can't wait to see her 2nd birthday! Man. Oh I adore this party. Love the theme and the airy color scheme. Loved the scrabble tiles, the cupcake picks, the clothes pins-everything! I would love it if you would share your party at my August, It's a Celebration, link party. I think my readers will love this as much as I did! This is the cutest party ever! Tiffany, every detail is seriously just amazing! Mia is a lucky little girl!! 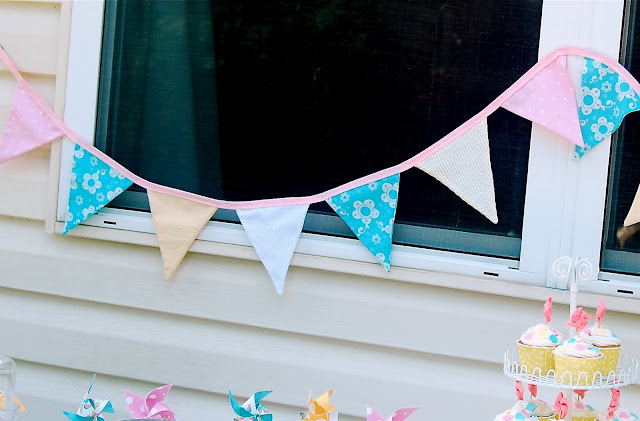 what an absolutely adorable 1st b-day party! i LOVE all of it...each and every detail is perfect! love the idea of a pinwheel & polka dot party-so creative! awesome job! Tiffany this is truly the most amazing party ever! You have really outdone yourself with the adorable details. I love the color pallet too, it's so soft and sweet, and the girls look so cute in their dresses!! 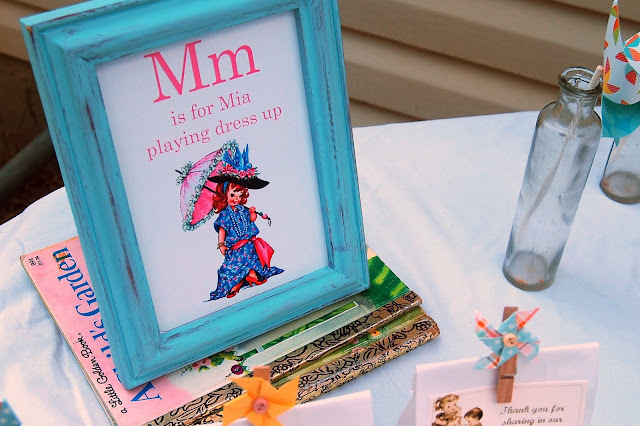 I am so impressed that you did this all on a budget too, I think people would pay big bucks to have a party exactly like this one for their little girls. Great job!! Mia must feel so loved! SUPER cute party!! love all the sweet details you put together!!! Found you on House of Hepworths! 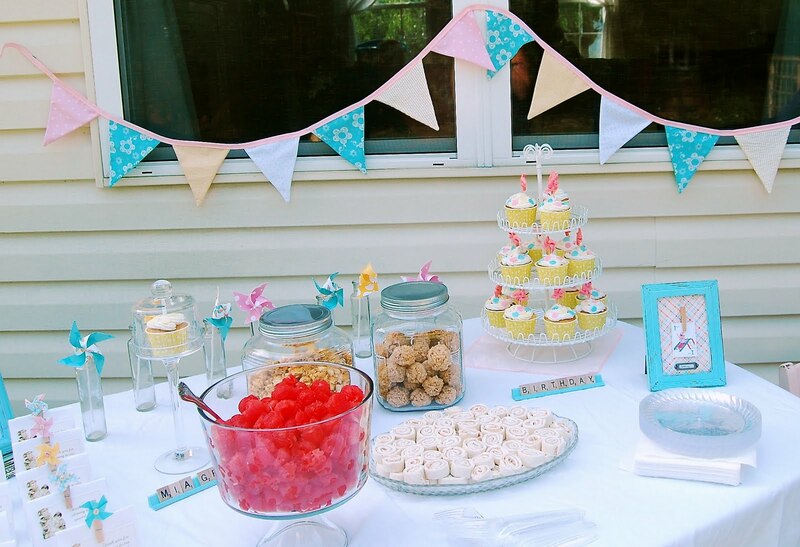 Great Party with lots of cute ideas. 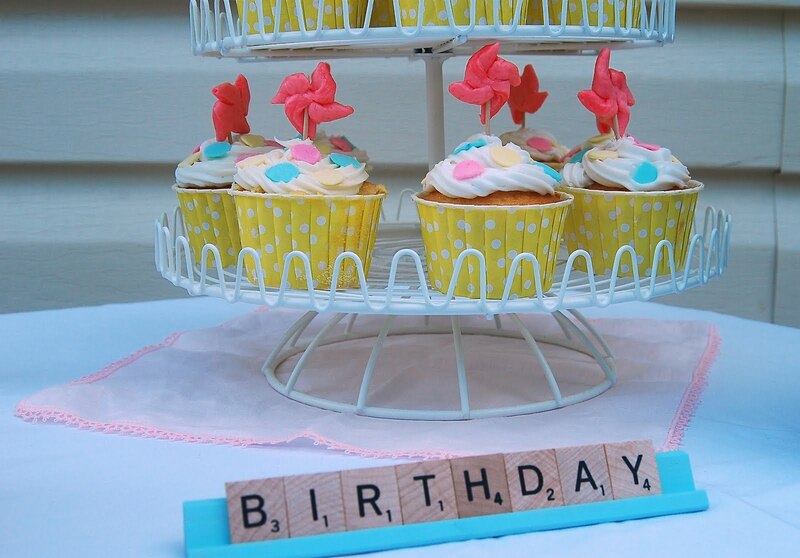 I love the cupcakes and the scrabble letters. Thanks for the inspiration, my baby's first birthday is this weekend! I may borrow a few ideas for last minute details! Oh my gosh how beautiful & sweet. My daughter is 10 & I think she would love a party like that. Beautiful party! Love having people write a note, such a great idea. What a cute party! I love all the little details, like the scrabble letters, the frame with card, and bubble gum machine! What a beautiful party! I love the retro touches! What a gorgeous party!! So creative! Thanks for linking up at my "It's a Celebration" link party! What a great 1st Birthday! Loved all the detail! !